I will start this letter by asking two questions: First, do you think creativity is seasonal? By which I mean do you think it has its own rythms and cycles but also do you find yourself affected by the Seasons, summer,winter etc? I ask because my sewing studio over recent days has been very hot. Its a loft extension and it retains heat brilliantly in the winter but also in the summer, although there are plenty of windows to open to cool it down. Still, if those have not been open during the day,and if, by the time I get home from work I am already wilted with the unaccustomed heat, going up there to do battle with a large quilt is not especially appealing. So the weather is affecting my creativity. As a result, last weekend I headed for my wet studio which is downstairs and does not get direct sun in the afternoon. I decided it was time to push myself forward with my Brick Lane series. 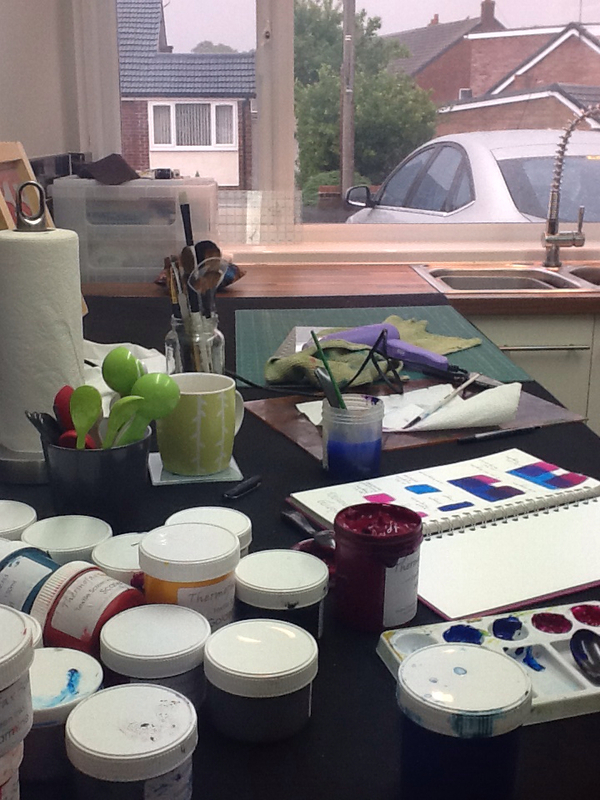 So I sat on my stool and looked at pots of paint and blank paper and fabric. The irony is that it was so hot that day that we got a thunderstorm and I was sitting avoiding dry arid heat whilst watching rain bounce and feeling the temperature drop. But it was lovely and cozy and I decided to stay. Which leads me to my second question: why is starting so hard? Away from the studio, going about daily life I have lots of ideas. But conceptual ones: 'my quilt will be about' kind of ideas. Not 'my quilt will look like this' ideas. I still really struggle with the visual portrayal of the message I want to send. (Life would be a lot easier if I just wanted to make pretty images of flowers,but I do not). So there I sat looking at paper. I decided not to design but to focus on learning what the media does better and to play with the transparency of the screen inks seeing what happened if I overlayed them. What happened was that for several pages I, very predictably, had squares of colour. Blah. Yet, it was relaxing. The patter of rain, a good audible book on the ipod, a hot cup of tea. And the permission in my head: you are not designing. You are seeing how overlapping inks work. How hard can that be? It was fun. And then after a while I told myself. Ok, so this is not producing much but what else are you going to do? Go and watch TV or do the ironing. Keep going. Just one more page. And then,suddenly my actvity totally changed gear and I made these two pages. And then I got excited. I know the pages dont look much but they have beginning elements of lots of things in my head and I can see all kinds of influences in them. By this stage I really did have to stop so I placed this sketch book open at these pages on the chest of drawers in my dressing room and I have been looking at them all week, eager to work more on the ideas they throw up. I remember deciding at the time that It worked well for me to have Sketchbook Sunday and to dedicate time to design play in this way. So its Sunday. I have some time before I go out - usually we do breakfast on a Sunday but today its afternoon tea to celebrate my birthday. And am I sketching or painting or collaging anything in a sketchbook? No. I am blogging. Which is on my To Do list but which is also a convenient Distraction Technique. Even though I do have ideas about what to do. So, why is starting so hard? And in particular, starting to design, to find a language to say what I want to say? Do you have this issue or is it a function of my goal drive personality again? I think maybe the two questions are related, that there is a natural cycle of creativity and that there is a hard period between the scattering of the ideas in my mind and their realisation. Just as there is a cold winter with frosted ground between the scattering of seed and the sprouting of crops. Of course, that cold time is (literally and figuratively) a good time to get upstairs and work on the more mechanical tasks of making an already designed quilt. What I need to work on though is getting that into a smoothly working cycle where both stages happen when they should and I do not resist either. Any suggestions? While you think about that I am going to go to Chester and try and break through the urban sketching barrier. ( Same barrier, different context). As you know I just came back from Dubrovnik . I went with all intentions of sketching all sorts and filling pages and pages. I did just two sketches of the city itself despite all the times I looked at things and thought: that would be good to draw. Hopeless. I don't even like them! Although I really enjoyed doing them,which is more the point,don't you think? Too hot. Book the wrong size for the topic. I need to make the most of rest time. I can sketch at homebut I can't swim in this amazing pool there. Husband is distracting me.I should come back alone so I am not spoiling his holiday making him wait here. I need to learn more about watercolor theory first....blah,blah,blah. Could you please just come over and physically make me do the work please? I will share my afternoon tea with you as thanks.